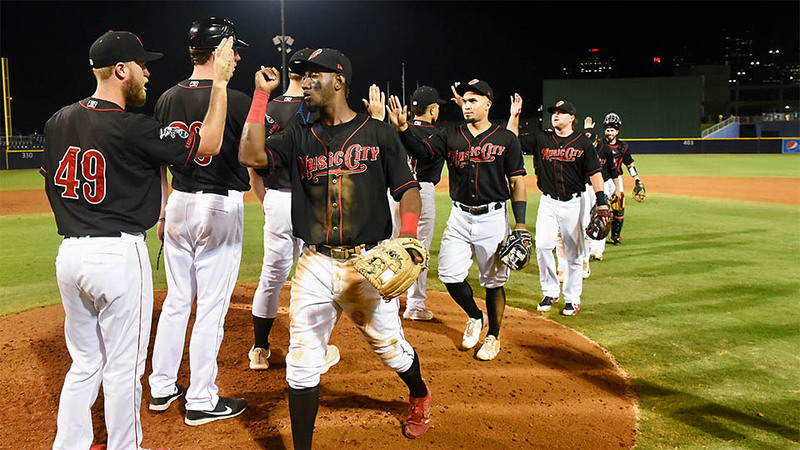 Nashville, TN – Franklin Barreto homered and Dustin Fowler added three hits as the Nashville Sounds topped the Round Rock Express, 8-4, Tuesday night at First Tennessee Park to extend their winning streak to 15 games. The 15-game streak matches a franchise record set during the 1999 season. Nashville’s winning streak started on July 29th in Salt Lake City with a 9-5 win over the Bees. They swept their last homestand – a seven-game stretch against Fresno and Sacramento – and swept Colorado Springs on the road before returning home. The Sounds have outscored their opponents 89-48 during the 15-game stretch. Round Rock jumped out to a fast start in the first inning and put up three runs against Nashville starter Frankie Montas. Just like the homestand opener Monday night, the Sounds weren’t fazed and had a comeback in store. Nashville answered immediately with three runs of their own in the home half of the inning. Anthony Garcia picked up his team-leading 80th RBI of the season and Sheldon Neuse drove in a run with a base hit. The Sounds took the lead for good in the second when Jorge Mateo sparked a rally with his 14th triple of the season. Boog Powell followed with a run-scoring groundout to give Nashville a 4-3 lead. In the fifth, Fowler started another rally with a leadoff single. Garcia walked and Barreto drove in his first run of the night with a single down the left-field line. Three batters later, BJ Boyd doubled to deep center field, driving in two more runs to make it 7-3. Montas settled in and retired 14 straight batters at one point. The bullpen tandem of Carlos Ramirez and Danny Coulombe combined to throw 3 2/3 shutout innings in relief. Barreto put a stamp on the 15th win in a row with a booming solo homer in the bottom of the seventh. He finished the game 2-for-3 with two runs and two RBI while Fowler finished 3-for-4 with two runs scored. Game three of the four-game series is scheduled for Wednesday night at First Tennessee Park. Right-hander Chris Bassitt (5-4, 4.48) starts for the Sounds against right-hander Chris Rowley (0-3, 5.40) for the Express. First pitch is scheduled for 7:05pm. With tonight’s 8-4 win, the Sounds improved to 66-55 on the season. The Sounds extended their season-best winning streak to 15 games and have set a season-high mark of 11 games over .500. The 15-game winning streak matches the longest in franchise history (June 2nd-20th, 1999). Dustin Fowler had another multi-hit effort, his seventh straight multi-hit game and 23rd in 41 games with the Sounds. Since re-joining Nashville on August 3, Fowler is hitting .542 (26-for-48) with 16 runs, 5 RBI and 9 extra-base hits. Jorge Mateo’s triple in the second inning was his 14th of the season. His 14 triples is tied for second-most in a single season.